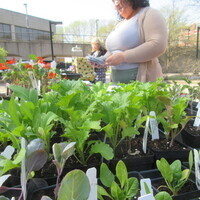 The Belknap Campus Farmers' Market returns for one-day only during Earth Week 2019! Stop by for farm-fresh local products, including produce, meat, eggs, breads, honey, popcorn, jams, pickles, reusables, clothing, linens, wood crafts, pottery, fair trade items, and more. Barr Farms will be on hand taking subscriptions for their Community Supported Agriculture (CSA) local food subscription service with pickups available at both Belknap campus (SAC Health Promotion Office) and HSC (Med Center One). Come meet the farmers and learn how you can enjoy a weekly (or biweekly) delivery of fresh, local, sustainably-grown produce from May through October! They also offer a meat CSA option.